This week is Asia Week in New York City, when auctions, dealers, and exhibits converge to promote Asian art and artifacts. With Asia on my mind, I happened to notice an article in Antiques and the Arts Weekly about Hiromi Kinoshita and her curatorial work at the Philadelphia Museum of Art. Since I was visiting Philadelphia, I decided to take a look at her new installation and reexamination of works acquired by PMA through the years. I wondered how the exhibition would be displayed. Not to worry. The large temple rooms, scribe’s room and tea house are still in place. The new installation is off to the side corridor. I really like Hiromi’s four themes. The first is Belief in the Afterlife. This exhibit highlights beautifully rendered funerary art. The second is a nod to our place in Nature and the Cosmos and addresses naturalistic symbols on various objects owned by scholars. China and its Connections to the West is the theme of the third gallery and examines art forms that were floated between China, Europe and America. I particularly enjoyed the comparisons between Delft and Chinese porcelains. The final exhibit underscores art owned by the Emperor and his Court. These works were loaded with symbolism and adheres to meaning and order in life. There is a hard cover companion book available in the gift shop, Art of China, Highlights from the Philadelphia Museum of Art, that is filled with beautiful photos and descriptions in case you cannot make it to the exhibition. It is a rainy Thursday in North Jersey. Temperatures are in the upper 50s, a far cry from 4 degrees this past Monday. Such are the temperature fluctuations in this region. At least there is no snow to hinder visitors to the Winter Show at the Park Avenue Armory. The Show runs from January 18-27 so there is still time to see some marvelous displays. We went to the Show on Saturday the 19th. I like to go as early as possible to enjoy the enthusiasm of the opening days. It is now Thursday. I have not had a moment to write until now and I am reflecting on what I saw and how I see the state of the market. My main interest is Americana. There were about ten dealers of Americana that I coud recall who were exhibiting at the Winter Show. Every booth was magnificent and always inspiring. But, I missed the colleagues who were not there. The feel of the show was different and to me, overwhelmingly modern. Not that there is anything wrong with that. Tastes change and the change was evident at the Show. To me, it appears that New York sets the tone for design and decoration and eventually, the rest of the world follows. If the Winter Show is any indication of the current trend then it stands solidly post 1900. Unfortunately, many folks are unaware of the changes in taste. This past week, I received several calls from clients who declared, "My parent has died, would you come and buy their furniture." "Their furniture" usually turns out to be reproduction 18th century pieces which have very little if any marketability at this time. It is a sad state of affairs but the reality of the times. 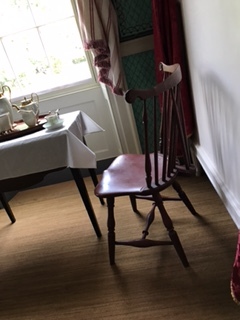 My advice to one friend, who recently inherited her parents furniture, "If you can hold on until 2026 ( the 250th Birthday of America) there might be renewed interest in American furniture." Or maybe, we dealers can manufacture a new trend toward "Going Green" and being environmentally responsible by recycling and reusing our parents beloved furnishings. Charlie in the booth of Olde Hope. David Schorsch's booth at opening on Saturday. Charlie and I braved the dire warnings of the weather forecast and took the New York bound train and Q subway to the Ceramics Fair at 321 E.73rd Street. The weather turned out to be perfect for travelling and we were glad we made the effort. The above image is the view from the third floor entrance into the show. There were 9 dealers total and the atmosphere of the show had a boutique quality. Almost immediately upon entering the show, my eyes fell upon this marvel of a book, " The Paragon Tea Wares Pattern Book" circa 1900-1933. This hard bound book contains hand colored pages of beautifully detailed flowers which were transferred to tea ware. The books and pottery were manufactured in Staffordshire, Stoke on Trent. Available with this particular book are 2 cups and saucers that demonstrate the artwork. I learned, that at the time, most of the pattern books were burned when they outlived their usefulness. The Ceramics Fair is open tomorrow. Free admission. Worth the trip to see VERY fine ceramics. This is the time of year when thoughts turn toward snow and antiques in New York City. A light atmospheric dusting of snow fell lazily as we headed out on Sunday morning into the city. Our focus that day was on Sotheby’s Auction Preview at 71st & York Streets. Previews are one of my favorite past times. Objects for sale are on display for potential buyers and curious onlookers to observe and touch.This is a hands on, take a good look and learn activity that is open to the public and FREE. Museums charge admissions. Auctions do not. If you want to learn more about antiques I highly recommend auction previews. Sotheby’s and Christie’s previews kick off Americana Week in New York City. Throughout the week, there will be auctions, shows, and special events. There will be four shows in NYC. The Art, Design, and Antiques Show opens on January 18, 2019. The Winter Show at the Park Avenue Armory runs from January 18-27. The New York Antique Ceramics Fair runs from January 17-20, and The Outsider Art Fair from January 17-20. Back to Sotheby’s. Because of limited time constraints, I chose Sotheby’s because there were particular items I wished to see due to their South Jersey and Philadelphia connections. A side chair Lot # 1613 from a suite of furniture made by Thomas Tuft (died 1788) was commissioned by Richard Edwards in 1775. Richard Edwards owned a home at 140 East Main Street in Moorestown, New Jersey and was a merchant in Lumberton, New Jersey. Where did Richard Edwards display this beautiful suite of furniture - in his home or in a show room in Lumberton? Edwards had 10 children. The furniture is in well kept condition. More research is required. The Stratton-Carpenter-Wheeler Families Mahogany Chest on Chest Lot # 1435 attributed to John Folwell was second on my list of must sees. This chest has a lovely Revolutionary War story to it. I know so well the story of the marauding Hessians who came through Moorestown and camped overnight in the Smith-Cadbury Mansion, sending the females of the house into a frantic tizzy. In a similar situation, British troops marched through Haddonfield to search the homes for arms. The frantic owner of this chest on chest, pulled it from the corner, and wrapped her 15 year old daughter in blankets, hiding her behind this very chest. A mother’s love gives Herculean strength in times of desperation. And here is what I mean about getting up close to take a better look at a piece of history with an estimate of $500,000. - $800,000. This is Lot # 1434 The Scott Family Carved and Figured Mahogany Dressing Table. Cabinet work attributed to Thomas Affleck (1740-1795) and carving attributed to James Reynolds (1736-1794) made in Philadelphia circa 1770. This was a learning experience and I think we spent about 15 minutes hovering around this piece. There were other fascinating items at the preview. Below is just a brief sampling. Lot # 1454 sold for $13,750. And a well known collector browsing the floor. You never know who you will see. Recently, we visited a Quaker family in Burlington County, NJ on a house call. Among other items, they wished to consign this photograph. The image itself was curious and we wondered if there might be something more hidden behind the photo. One clue - The frame was grain painted beneath the varnish. Another clue - The frame construction appeared to be older than the image it contained. Plus a wood backboard and undisturbed tacks. I took it home and left it in a corner for a few days. Finally, at the right moment, I sat down and carefully removed the tacks. I was hoping for a fraktur or a birth/marriage certificate. I held my breath. It was an Award of Merit, issued at Westtown School in Pennsylvania in 1886 to Edward T. Middleton. I assume, the calligraphy was executed by Edwin Thorp, who was a teacher at Westtown School at that time. These awards are lovely and I'm certain, a coveted trophy by the student. I contacted the consigner and they wished to keep the calligraphy. They have a son named Edward. They did not know this story. I hope, if anyone ever learns about my heritage that they will share it with me. I am a child of the 60's. I knew the painting American Gothic and associated it with Kellogg's Cornflakes. Now that I am approaching my 60's, I have come to appreciate Grant Wood's skill. I highly recommend a trip to the Whitney Museum in NYC to view the exhibition of Grant Wood's work. I find it very engaging. There is also a beautiful book for purchase filled with his creations and interesting essays. On view until June 2018. The Museum of the American Revolution opened Spring, 2017. During that time, Charlie & I were in the middle of a major move, from our home of 30+ years in Moorestown, NJ to Maplewood, NJ. Simultaneously, our daughter decided she wanted to get married during all the commotion. We produced a lovely February 2018 wedding for her (60 degree temps that day, to my relief) I mention this only because now we seem to be locked into the winter that will never end, even in April! At the first opportunity in February, 2018 we determined to see the Verplanck’s Point Exhibit at the Museum of the American Revolution located at 101 South Third Street in Philadelphia. I was VERY excited to see this exhibit. On display in the first floor exhibition hall was a 7 foot long panorama of a Revolutionary War watercolor that is “the only known wartime depiction of George Washington’s headquarters tent.” It was breathtaking, not only in terms of artistic merit, but, because it was an actual depiction of the layout of the camp at Verplanck’s Point in New York in 1782. Where is Verplanck’s Point and who was Verplanck? According to the HudsonValleyGal, Verplanck’s Point was originally purchased from the Native Americans by Dutch colonist Stevanus Van Cortlandt in 1683. 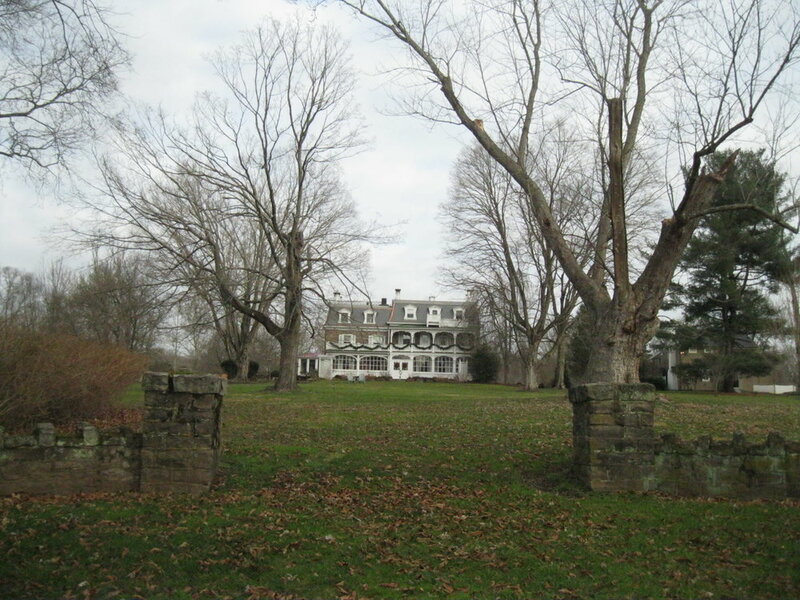 His granddaughter Gertrude inherited the property and married Philip Verplanck who renamed the land Verplanck in place of the original Native American name, Meanagh. By the way, Philp’s parents were Jacobus Verplanck and Margaret Schuyler. The 7 foot panorama was painted by Pierre Charles L’Enfant. L’Enfant was the son of a painter and had studied at the Louvre among other prestigious art institutes. He came to America as a French soldier and served on Washington’s staff in Valley Forge and in the Hudson Valley. The watercolor was divided into 6 parts, mounted on linen and bound in book form. It was auctioned in May, 2017 at Heritage Auctions and purchased by Philip Mead, chief historian and director of curatorial affairs at the Museum of the Revolution. Mead was thrilled to purchase such an important piece of American history that coincided with the Museum’s opening and depicts the historic headquarters tent. A word about the Museum. If you go, allow plenty of time. There is much to see, read, experience, and ponder. Take the children. Even though there is a lot of reading, the experience will stay with them. Lots of hands on activities. I particularly enjoyed the film in the theatre that discussed the war. The finale of Washington’s actual tent on display is very moving. The Verplanck's Point exhibition closed on February 19, 2018. Here are some scenes from the 2018 New York Ceramics and Glass Fair. I could not wait to see this exhibit. Below are examples from over 85,000 (yes 85,000!) fragments recently dug from a brick lined privy shaft in Old City Philadelphia during an excavation by archaeologists from the Commonwealth Heritage Group. The location was on site at the new Museum of the American Revolution. This area was probably the dumping grounds for several 18th century taverns. Conservator Melba Meyers painstakingly reassembled these treasures and they were exhibited at the 2018 Ceramics Fair in NYC.This undocumented slipware was probably made in Philadelphia by early French or German colonists. Interestingly, slipware of similar marbled design was uncovered in the Montpelier area of Southern France. These pieces were made during the late 1600's. Fascinating to imagine a design concept crossing the Atlantic to the New World. The exhibit was sponsored by Ceramics in America/ Chipstone Foundation and the Museum of the American Revolution. Specialist Ceramics Scholar Debbie Miller gave a detailed presentation during the event. For more information and future releases and analysis, contact Rob Hunter. Scenes from the Outsider Art Fair, 2018 in NYC. Something so soft carved into something so hard. Granite Bird Family. Steven S. Powers booth. From time to time, folks ask me where we like to stay while on the road. I highly recommend Bluebird Cottage at Oliver Creek Farm air bnb in Troy, Virginia. The 2 story house is located on Ghost Dance Road on a very private farm. The grounds are well kept and much nicer than I expected. Justine and her husband own the farm. Her restored Victorian farmhouse is about 100 feet away so there is plenty of privacy. Justine is very interesting and the cottage is loaded with books, particularly on the topic of photography. I would definitely return to this lovely secluded location. 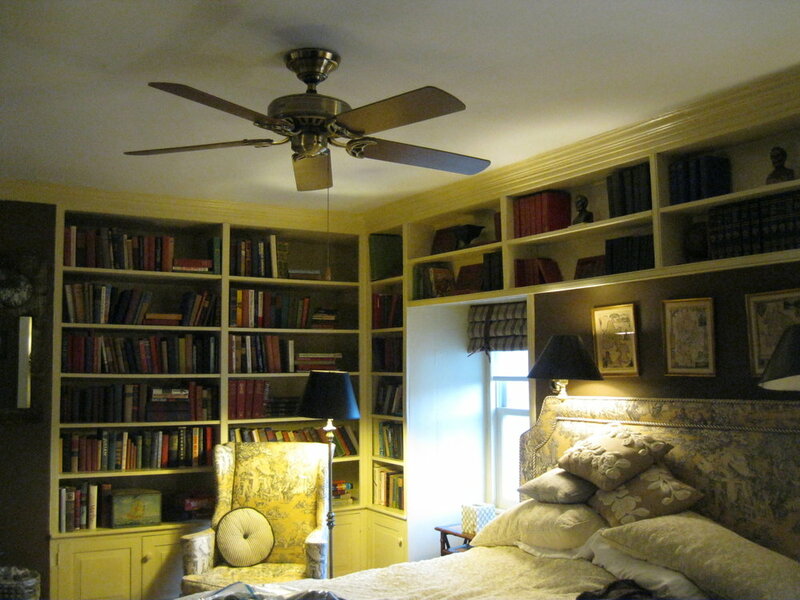 I could spend time here just in the cottage itself, perusing the books or working on my own research. The farm is close to Monticello and Montpelier. If you enjoy photographing sunsets, this meadow will give you ample opportunity. I believe there was a Civil War battle near here. Gives me a bit of a shudder to think.